Had I mentioned it’s warm here? It’s not all clear skies and sunshine, in the mornings it’s been chilly enough I’ve used arm warmers and my gillet. This is of course at about 5:30 in the morning when a long ride typically starts. By about 7 things have warmed up enough you can strip down to shorts and a jersey and it’s all good. I’m planning a few runs in the peak of the heat to find out just what it feels like. Next week’s Gold Coast half promises to be warm. I got to drive round the course earlier this week it’s flat and very exposed. It could be like the Worlds all over again, the winds will be the big factor on the bike. Then it’s a matter of how I cope with that heat. I’m looking forward to it now though, can’t wait to give it a go. After a ‘summer’ of damp, cold races I’m in need of some warmth. The racing front is looking all set for the year now and I’ve a few ideas for next year, there’s plenty to choose from. On the training side a couple more decent rides and a couple more training partners met. I’m pretty much set for someone to ride with and somewhere to go for the next 2 days. Tomorrow is a long, hilly loop to the south of the GC with a couple of guys. I’ve been saving my legs for this as based on the past week they like to ride the hills hard, there won’t be much cruising going on. Monday I plan to head west and climb Springbrook which I haven’t done since last year. Hopefully no incidents involving Magpies this time. Some open water swimming should be on the cards too next week, back at the shark free lake. Not sure on the water temperature, but I know whilst described as cold it’s warmer than back home. Today’s my day off from swimming, I’ve done 19.5km in the pool so far this week with 1 more session planned to get me on target. My training plan is slowly coming together, I’ll basically have 6 sessions in each sport giving me one day off from each. Easy weeks and tapers will see me reduce the number and length of sessions plus they’ll be rest days. As I’m covering all 3 sports I guess I should mention running. Whilst running is where I started it gets treated like the ugly cousin to the rest of my training when it comes to writing about it. A lot of run training is quite dull, once you’re established somewhere you tend to get stuck into routines and routes. Hopefully things will get a bit more interesting in a few weeks as Pete, my masseur and a training partner, has offered to take me trail running. I’ll be needing some decent off-road shoes, those Salomon Wings look pretty good too. It’ll be nice to break up the run training with some variety like this. So things are pretty much settled. I think next time I post I’ll have my basic week in place and will try to come up with some fancy way to get it on the site. I’ve stocked up on nutrition and supplements, stopped in at the local tri shop and got some good training lined up. I’ve also just added to the Australian experience with the first quarter of an AFL final on TV. Off for that hot run now, though there’s a cool breeze too. 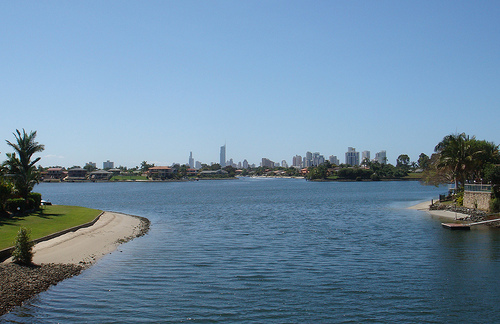 I’ll follow the outskirts of Bond Uni lake and think about the Bull Sharks that inhabit it.